CONSUMER spending during America’s Thanksgiving weekend dropped compared with last year, but the decline can be attributed to an improving economy and changing shopping habits, a survey found on Sunday. Typically Black Friday is often considered to be the United States’ top shopping “holiday” when businesses usually offer deep discounts starting early Friday morning, thus prompting massive crowds to take advantage of the best deals from retail outlets. In previous years, the turnout has resulted in numerous injuries and a number of deaths. 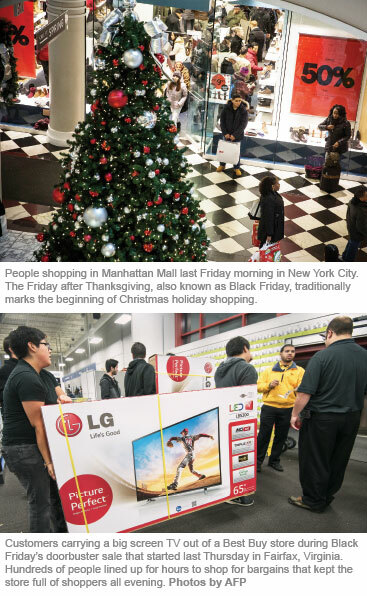 But while there was a surge in online sales with smaller crowds in stores, Black Friday still brought some of its trademark shopping mall pandemonium, AFP reported, citing injuries and arrests as well as protests that were held over the decision not to indict the police officer who killed an unarmed black teenager in Missouri. Still, this year, businesses continued a trend in starting shopping deals earlier and extending them longer, leading to smaller crowds. But many major retailers, including discount megastore Walmart, emphasised online shopping as a way to get consumers to purchase faster. An early report from commercial analyst ChannelAdvisor Corp showed up to a 22% increase in Black Friday online shopping compared with last year. The firm also reported a 20% increase in online sales on Thanksgiving Day. For the first time the majority of online sales came from mobile devices, a report by IBM said. “Online shopping started while turkeys were still in the oven and yesterday (last Thursday) was our second-highest online sales day ever — topped only by Cyber Monday last year,” said top Walmart executive Laura Phillips last Friday. Last year’s figures showed US$57.4 billion (RM197.5 billion) in total sales over the Black Friday weekend, a drop of 2.7% from 2012. The largest day of online sales typically comes on the Monday following Black Friday, when stores offer a number of online- only discounts. According to the National Retail Federation’s (NRF) Thanksgiving weekend spending survey, 55.1% of holiday shoppers were expected to visit stores or go online over Thanksgiving weekend, down from 58.7% last year. “A strengthening economy that changes consumers’ reliance on deep discounts, a highly competitive environment, early promotions and the ability to shop 24/7 online all contributed to the shift witnessed this (last) weekend,” NRF president and chief executive officer Matthew Shay said in a statement. According to the survey, the average weekend shopper was expected to spend US$380.95, down 6.4% from US$407.02 last year. Of that amount, US$159.55, or nearly 42%, was spent online, down from US$177.67 spent online last year. Total spending was expected to reach US$50.9 billion, down from last year’s estimated US$57.4 billion. However, the weekend has been expanded into a number of specialty commercial “holidays”: “Gray Thursday”, “Small Business Saturday” and “Cyber Monday”. Of those who went shopping on Saturday, three-quarters said they did so specifically to support “Small Business Saturday”, which is a growing movement to encourage residents to support local sellers. “Early online promotions before the big weekend may have taken some of the consumer’s spending power with them,” the NRF statement read.